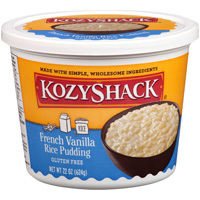 Say bonjour to the rich vanilla flavor in our French Vanilla Rice Pudding. Reduced Fat Milk, Cane Sugar, Rice. Contains Less Than 2% of Eggs, Natural Flavor, Salt, Annatto Extract (color), Ground Vanilla Beans.